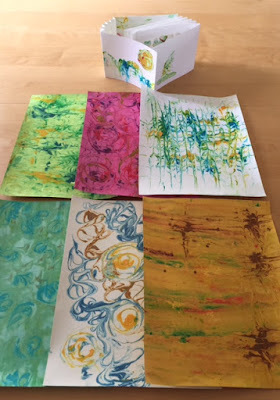 Lara Cox will lead the May workshop to make marbled paper using shaving cream (that's right, SHAVING CREAM) and colorants such as food coloring and acrylic paints. You will come away from the workshop with many sheets of beautifully marbled paper for use in book arts. This art project is easy and fun! A note on the shaving cream: Please avoid the super scented ones like Barbosol as the scent may linger on your paper for months. Also, since we will be working in a large group with lots of shaving cream we don't want to create a perfume scented overload for our senses. Please see the brand suggestions in the list below. One can of Shaving cream (NOT GEL!) Lara recommends these brands from the Dollar Store: 1. Assured Men's Shave Cream (sensitive). It comes in a red can and has just a slight soapy smell. 2. Assured Ultra Rich Women's Shave Cream (sensitive). This is raspberry scented but not too strong and it comes in a fuchsia colored can. Colorants: Food coloring. Also, liquid acrylic paints for added interest. A shallow glass or plastic pan big enough to hold an 8 1/2 x 11" sheet of paper. A spatula to smooth the shaving cream. Chopsticks, Popsicle sticks or other similar tool for stirring. A small paint brush for spattering paint. Cardstock of various colors, including whites, pastels and brights. RSVP: YES! to Lara by May 10. Her contact information is in the newsletter.